The Panasonic EP-30007 is just a huge as the model number seems. It is available at a cheap rate of $3,700 with free shipping. A company like Panasonic always has a little more price on its chairs than the market and still owns the top end of the lane. The features involved in the massage chair are even more attractive with the trust mark of the product being 100% Japan made. The trust issues with the parts and features even at this low price are completely solved. This model specialises in the Junetsu technique of massage which provides deep tissue relaxation with a soothing relief from the sore muscles throughout the body. The other massaging techniques involved in the features of the chair are Shiatsu, deep, Swedish, quick, stretch. The chair works fully functional in all of these modes of massaging. The chair has auto recline and at full recline the deep tissue massage works the best among all other chairs in this price range. The legs area is concentrated with air cells which along with the rollers enhance the regional roller feature. Intensity control adjustment has very sensitive variations available to let the user decide the kind of intensity they require accurately. This prevents the user from any discomfort that may come from both over powered and power lacking massages. The Quad style massage technology is a heads up in the new and sleek massaging technologies. The Ep-30007 is an updated version of EP-30006 and EP-30005. But, unlike the other two models, it is exclusively made in Japan and shipped directly. The arm rests have a wooden lay finishing with dark faux which is the most comfortable arm rest leather. The upholstery of the chair is quite strong yet comfortable. The roller track has an extension limit of 30” strokes which lets the rollers to reach the bottom of the lower back with as much desired power as the user wants during the massage sessions. 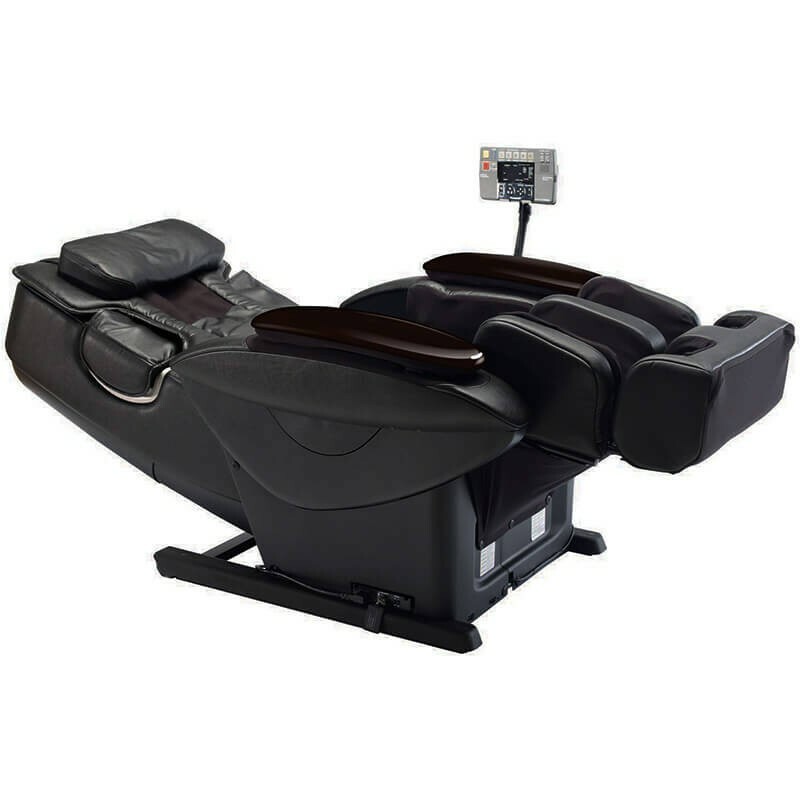 The massage chair also massages the soles of the feet with the reflexology and the pressure of air bags which is rare to be found in the massage chairs at this price range. The massage chair does not have the heating feature and that is why many traditional massaging modes lack full functionality. Also, the chair lacks flexibility among different body shapes. For people with a short height, the chair gets too clumsy and the air bags do not get enough area to stretch out with full pressure to the muscles. For people with a taller height than 6 feet, the leg area gets short and the legs do not fit or the recliner stays bent. The recliner is stagnant and does not come up with the rest of the chair and that is a big let down after the unavailability of the heating function. The memory functions comes only for 4 users and this is another important con as with the chairs with customization manual selections, more memory is preferable with the functions. For the ones who do not like the heat feature in massage chairs, this is the cheapest of the best massage chairs you can get at this price range. With the tag of Panasonic and the clear manufacturing guarantee from Japan and shipping direct to the user, the massage chair gains trust of a lot of people looking around for a good massage chair for a long term of use.